An Uzbek-Emirati investment company will be created in Uzbekistan, according to the presidential decree. Its founders will be the Uzbek Fund for Reconstruction and Development together with the Abu Dhabi Development Fund (UAE). The investment company is created in the form of a limited liability company with a statutory fund of $ 5 million and a declared capital of $ 1 billion. Abu Dhabi Development Fund (UAE) will have 75 percent of shares and the Uzbek Fund for Reconstruction and Development - 25 percent with the possibility of attracting additional participants. The company will have the right to make investments through the shares acquisition in the authorized capital of existing and newly created economic entities, to allocate loans, issue securities, sell to domestic and foreign investors of the investment company in the authorized capital of economic entities and in other forms not prohibited by law. It will also perform functions for the development of investment cooperation with investment, financial institutions and UAE companies coordinates investment interaction with them and accompanies and assists in the implementation of joint investment projects. The document provided the Uzbek-Emirates investment company with a number of benefits and preferences. An investment company, as well as its founders, is exempt from income tax for three years, including income from dividends and interest, property tax and land tax, as well as value added tax on the sale of its property and assets. In addition, newly created enterprises, at least 30 percent of the authorized capital of which is formed at the expense of the investment company, are subject to the privileges and preferences provided for by legislation for enterprises with foreign investments. The Abu Dhabi Fund for Development (ADFD) is a foreign aid agency established by the government of Abu Dhabi in 1971. ADFD’s mission is to help developing countries achieve sustainable economic growth and reduce poverty. To do so, ADFD provides concessionary financial resources in the form of sovereign loans that satisfy the concessional conditions in accordance with the requirements of the Organisation for Economic Cooperation and Development (OECD). This strategy is an enhanced plan of the '2015-2019' strategy following the 2013 amendment to ADFD's law of establishment which included a capital increase to 16 billion ($4.36 billion) and the expansion of its operations to finance development projects in the UAE. 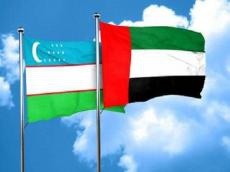 Diplomatic relations between Uzbekistan and the United Arab Emirates were established on October 25, 1992. Uzbekistan and the United Arab Emirates have created a joint fund of foreign direct investment worth $ 1 billion on October 3, 2018. Currently, Uzbekistan has more than 90 enterprises established with the participation of UAE investments, 36 of them with 100 percent UAE capital. Uzbekistan's main exports consist of raw cotton fiber, silk, agricultural products and services. Import from the UAE consists of mechanical and electrical equipment, coffee, tea, furniture, plastics and rubber products, vehicles, clothing and sports equipment.